As we enter April, a school vacation is coming up and perhaps you're looking for something to do. If you have ever been caught by the Brown Sisters photos, you can see them at the ICA in Boston through Apr 22. 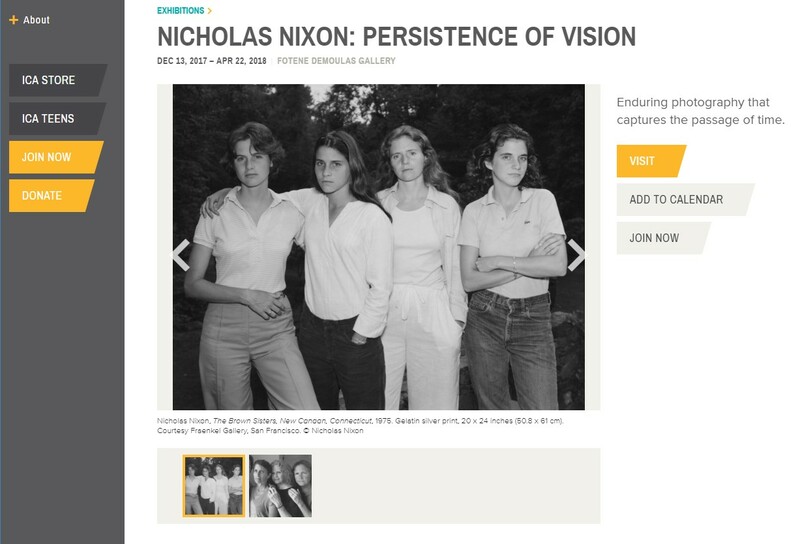 "As an exhibition title, “Nicholas Nixon: Persistence of Vision” is almost self-explanatory. The show runs at the Institute of Contemporary Art through April 22. Nixon needs no introduction around here. For many years, he’s been one of the starriest names in what has long been a very starry photography faculty at Massachusetts College of Art and Design. And since his inclusion in the ground-breaking 1975 exhibition “New Topographics: Photographs of a Man-Altered Landscape,” Nixon has had a national, and eventually international, reputation for decades. So the Nicholas Nixon part of the title is clear enough. Ditto “persistence.” Nixon turned 70 in October, and the show’s 112 black-and-white images start in 1974 and extend to this year. In fact, there are two or three photographs for each year. The sole exception is 2017, which has just one image: the latest iteration of Nixon’s most famous body of work, “The Brown Sisters.” The series consists of an annual group portrait of Nixon’s wife and three sisters-in-law."